Winter just won’t give up! Woke to seven degrees this morning – and the piles of snow which feel like they’ll be here, swaddling the house, forever. Will spring really come? Are we ever going to look outside and see some green? Even the birds have deserted us – which may have something to do with the fact that I just can’t face digging through these many feet of snow to fill the feeder. Tomorrow, I think, tomorrow I’ll get out the shovel. But today, I’m making this wonderful snack. Nothing tastes better at the end of the day with a good glass of wine. 1. Combine the warm water, yeast, and sugar in a bowl and wait for it to foam, about 5 minutes. If it does not foam, discard and start with over with fresh yeast. Either the yeast is too old, or the water may be too hot. It should be tepid at 90-100 degrees. Stir in 2 tablespoons of olive oil. 2. Whisk together the pastry flour, the semolina flour, and 1 teaspoon of salt. 3. Make a well in the center of the flour and pour in the yeast mixture. Stir the flour into the liquid until it comes together in a ball. Knead for up to 5 minutes on a floured surface, and then place in a well-oiled bowl. 4. Cover with a moist towel and set in a warm place to rise until it is doubled in size, about an hour. Tip: If you want to hurry things up, place the bowl inside another bowl filled with very warm water and cover it up. 5. Meanwhile, mix 1/3 cup of olive oil, the paprika, oregano, anchovies, and one teaspoon of salt and set aside until the dough has risen. 6. 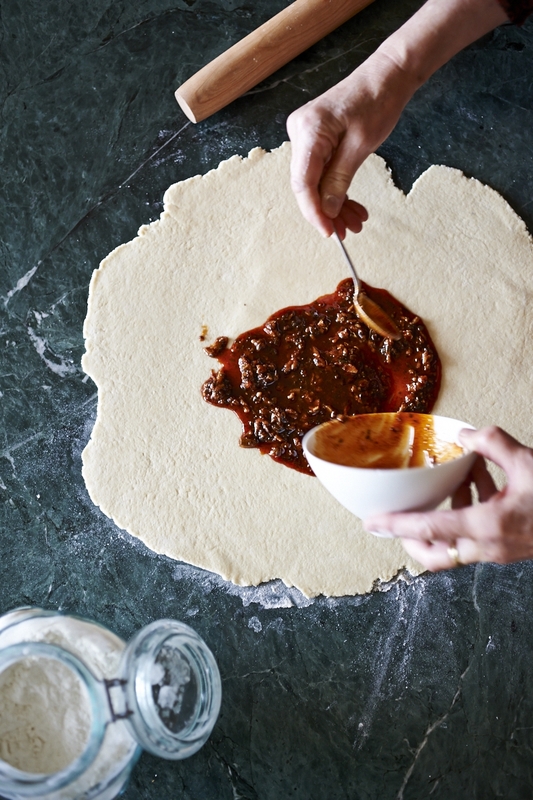 Roll the dough out into a 15 inch round, and spread all but 1 teaspoon of the anchovy mixture all over, leaving a one inch border. 7. 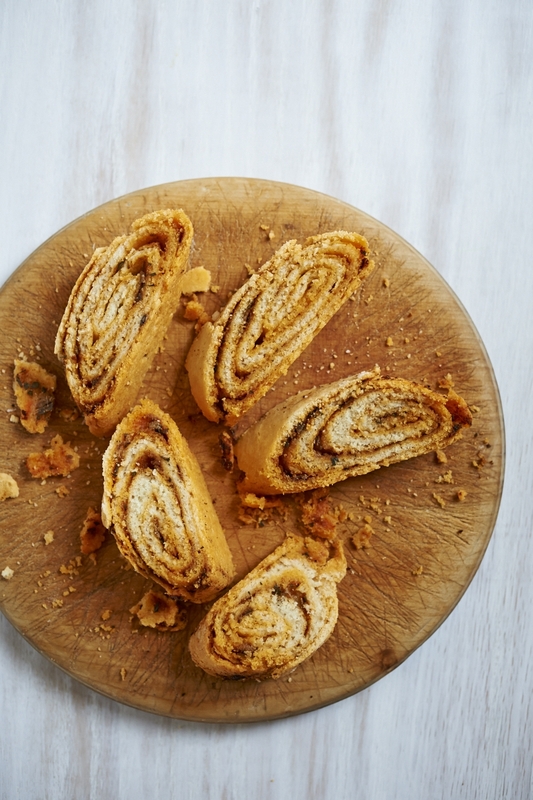 Beginning with the side closest to you, roll the dough into a thin jelly roll, and pinch the edges closed. Starting at one end, curl the roll into a spiral (the sides can touch), and set onto a baking sheet lined with parchment paper. 8. Brush the top with the remaining oil and sprinkle with a teaspoon of salt. Cover with plastic wrap and allow the bread to rise for one hour. Bake for 35 minutes until crusty and golden. Remove to a rack and allow to cool completely. Cut into thin slices.